Wat Chedi Luang is one of Chiang Mai’s most noteworthy attractions as well as one of the most important temples in the city. “Luang” means large in the Northern Thai dialect and the name is apt for the sprawling site where the temple sits. Whether you’re visiting Chiang Mai for a few days or a longer stay, it’s well worth your travel time to visit the temple. 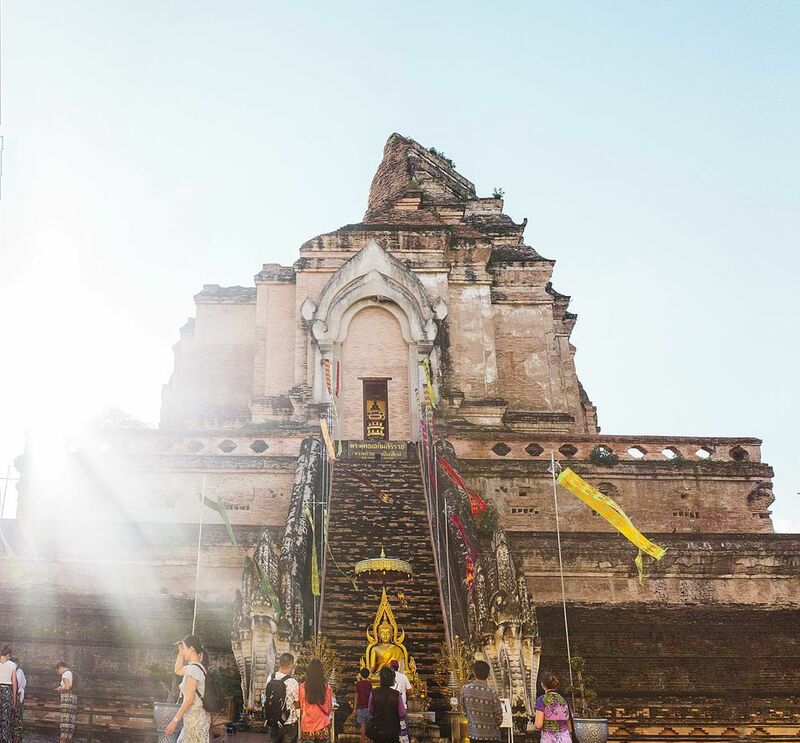 Read on for everything you need to know about getting to Wat Chedi Luang and what to expect when you’re there. Wat Chedi Luang was built between the 14th and 15th centuries and at the time would have been the most impressive temple in Chiang Mai. It remains one of the tallest temples in the city, but at one time the pinnacle of the chedi (pagoda) rose over 80 meters (well over 260 feet) into the air. A large earthquake (or cannon fire—there are conflicting accounts) substantially damaged the chedi and it now measures around 60 meters (197 feet) high. Wat Chedi Luang is also famous for once housing the Emerald Buddha, one of the most important religious relics in Thailand. It was moved to Wat Phra Kaew (Temple of the Dawn) in Bangkok in 1475, but there is a now a jade replica housed at the temple, which was given to the city as a gift from the Thai king in 1995 to celebrate the 600th anniversary of the chedi. A restoration project by UNESCO and the Japanese government in the 1990s worked towards restoring the temple to some of its former glory, but the main goal was to stabilize the site to prevent further damage. The top of the chedi was never reconstructed because there was no clear idea as to what it originally looked like before the destruction. Since the grounds of Wat Chedi Luang are quite large, there’s lots to see on a visit. The most prominent feature here is, of course, the massive chedi that dominates the area and it is an impressive and photo-worthy site. The base of the chedi has five elephant sculptures on the south side and all four sides of the chedi have large staircases that are flanked by naga (serpents) giving the structure a mythical feel. At the top of the staircases there are small niches containing stone Buddha images, though in the niche on the eastern side of the chedi is where the replica of the Emerald Buddha was placed. On the temple grounds you’ll also find two viharns (sanctuaries or prayer halls), the larger of which houses a beautiful standing Buddha statue known as Phra Chao Attarot. In addition to the main viharn and the chedi, the temple grounds contain a smaller building where you’ll find a reclining Buddha and another building containing the city pillar (Sao Inthakin), believed by locals to protect the city. Wat Phan Tao, another temple, also lies on the grounds of Wat Chedi Luang. While much smaller than its massive neighbor, the beautifully-carved teak temple is well worth a look if you’re already planning to check out Wat Chedi Luang. The serene gold Buddha in the main prayer hall and small garden around back are highlights. It’s relatively easy to visit Wat Chedi Luang since it’s located inside the walls of the old city and close to other major temples, as well as many guesthouses and cafes. The temple is open daily from 8 a.m. to 5 p.m. and while it used to be free to enter, the entrance fee is now 40 THB for adults and 20 for children (free for locals). The temple can be found on Prapokklao Road, which runs north to south along the center of the old city between Chiang Mai Gate and Changpuak Gate. The main entrance is opposite Prapokklao road, just South of Ratchadamnoen road. Once you’re in the old city, the temple should be easy to spot since the chedi is one of the tallest structures in Chiang Mai. Any songthaew (red trucks that act as shared taxis) can take you to the temple within the old city for around 30 THB per person. As with any other temple in the city, keep in mind to dress respectfully, which means shoulders and knees should be covered. The impressive chedi is a highlight in and of itself, as is the majestic standing Buddha in the main prayer hall. But simply walking through the temple grounds makes for a pleasant afternoon when combined with more exploration of Chiang Mai’s charming old city and its many other temples. Visitors should also consider taking part in the daily monk chats that happen at Wat Chedi Luang. Between 9 a.m. and 6 p.m. daily you can see monks waiting on the north side of the temple grounds who are available to talk. Chats are usually with novice or younger monks and the conversations are a win-win: Monks get to practice their English, and you get to find out more about Thai culture and Buddhism.